Towards the end of 1997 as the aircooled season was coming to a close, it became clear that there was still something missing here in Germany, a pure Old School Cal Look or Resto Cal Look orientated club! The problem was that Resto Cals and Old School cars were out there, but in normal VW clubs they seemed to disappear. A group of friends who shared the same passion in VWs decided to do something about it. Karsten Feldsieper, Thorsten Henke, Christoph Moos, Georg Otto, Gregor Schilling and Christian Veit decided to form a national Club for Restos and Cal Look Volkswagen owners. The major influences behind the DFL were clubs like DAS (Der Autobahn Scrapers) in Belgium and DKT (Der Kleine Torpedo) of Austria which were already up and running and very popular in their relative countries in Europe. DFL also took inspiration from several VW clubs a little further afield such as the mighty DKP. The rules and regulations used by most VW clubs, were chosen for DFL, but we included strict rules on the cars, as these were as important as the shared activities we planned. Statutes were formed and then it was just a case of finding the right name, and this was far from easy! We wanted the name to consist of three words, as had become the norm in the Seventies in California. The word Luftkühlers was an easy one - as it means air-cooled, the rest would prove a lot harder! After throwing a few names around, some good, some bad, one of the founder members said "That sounds fierce!" The German for fierce is "Fies". That led to the birth of Der Fieser Luftkühlers in 1998. The basic translation into English is The Fierce Aircoolers, and is abbreviated into DFL. Now all we needed was a club emblem. As you can imagine the creation of our emblem was no easy task, it took a lot of serious beer drinking before we were anywhere near finished! By accident we found an old logo from the Deutscher Touring Club in a very old issue of the German car magazine Gute Fahrt and decided it was the perfect basis for our club badge. 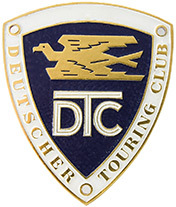 The DTC was an automobile club, comparable to the ADAC or the AvD, in case you didn't know. The first VW event the DFL visited as a club was in 1999 at the Bad Camberg Vintage VW show known in Germany as the international Veteranen-Treffen and held over the weekend of June 18th to 20th. At long last Germany had a Cal Look club! Our cars were obviously displayed outside of the main arena, but they were well received and photographs of the club cars and club display were all over the internet soon after the show. DFL had arrived! The most significant change since the start of the club in 1999 happened in February of 2004. As time passed by years virtually all of the DFL club cars had developed into traditional Cal Look cars and the decision was to change of the rules of the club to make it California Look only.